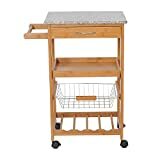 Save on Kitchen Islands & Carts at Epfup. Top brands include Eagle Furniture, & totoshopcabinet. Hurry! Limited time offers. Offers valid only while supplies last. New Kitchen Island Cart Trolley Portable Rolling Storage Dining Table Bamboo 31"